Ciao'd with the AC on full blast. 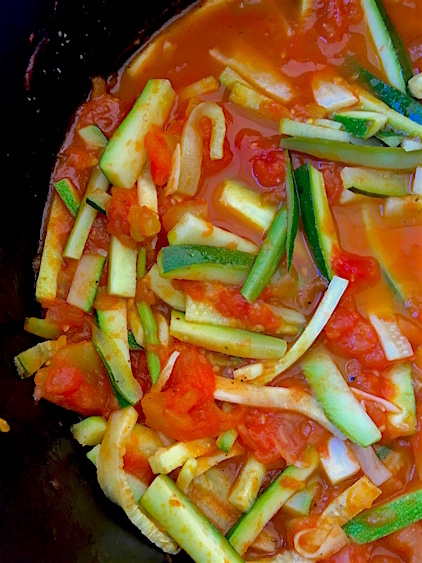 Two classic summer flavors, zucchini and tomato, pair together in this light, vibrant, quick-cooking sauce. Marcella Hazan suggests, "The taste comes through even more explicitly if you can obtain vine-ripened, fresh, firm tomatoes." And she shares another secret: "An important component of the light, bright flavor is the way the garlic is handled. It is sliced very thin and aside from a brief, preliminary contact with hot oil, it is simmered in the juices of the tomato so that what emerges of its aroma is the sweetness rather than the pungency." While Marcella calls for scooping away the tomato seeds, I left most of them intact as I like the flavor the seeds impart. Cut the zucchini into fine julienne strips. Put the garlic and olive oil in a skillet, turn on the heat to medium, and cook, stirring two or three times, just until the garlic becomes colored a very pale blond. Add the chopped tomatoes, turn the heat up to high, and cook, stirring frequently, for about 10 minutes, or slightly longer if the tomato is watery. Add the zucchini, salt, black pepper, and cook for 5 to 6 minutes, turning the ingredients over from time to time. The zucchini should be quite firm - al dente - but not raw. Cook and drain the pasta and toss it immediately and thoroughly with the sauce, mixing into it the basil shreds. Serve promptly. Marcella Cucina, Marcella Hazan, Harper Collins, 1997. *How to peel and seed a tomato: Core the tomato. Bring a large pot of water to a boil. Drop the tomato into the boiling water (you can add several tomatoes at a time). Remove the tomato when the skin begins to peel, 15 to 30 seconds, and put in a blow of ice water to cool. The skin will slip off easily. Cut the tomato in half crosswise and scoop out the seeds.